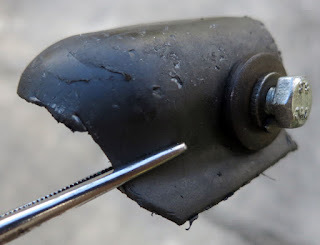 Bolt shows damage from the drive chain of my Royal Enfield Bullet. With my new and (hopefully) improved shift linkage now in place, all that remained was to go for a test ride on my 1999 four-speed Royal Enfield Bullet. There was one last thing that still bothered me. It's the bolt that pinches the linkage to the shaft that carries the shifting action from the left-side gearshift to the gearbox on the right. 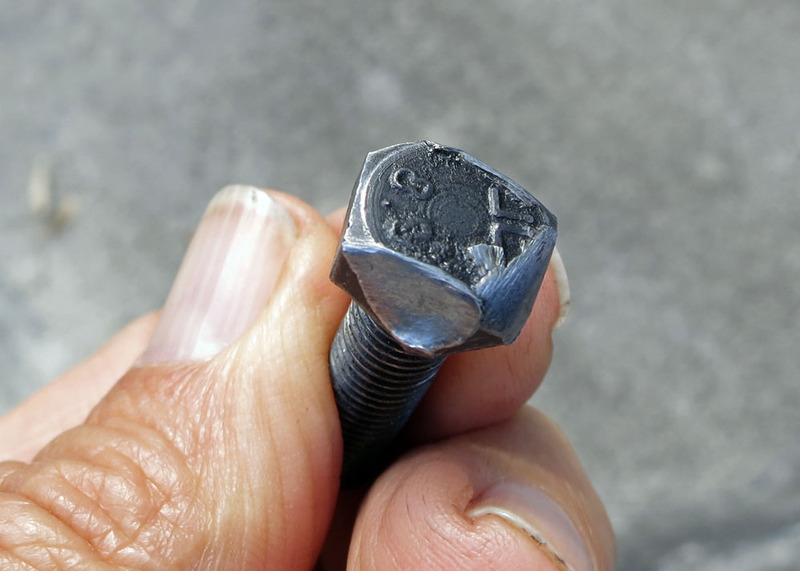 Examining it, it's apparent that this bolt gets worn down by the drive chain. 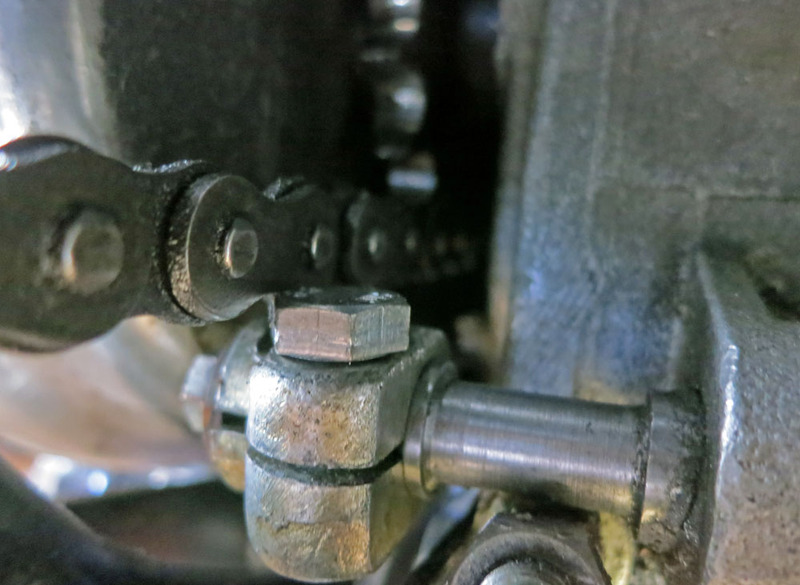 As best I can see, the lower run of the chain hits the bolt only when the motorcycle is on its center stand. So this should not be much of an issue while running; but the wear on the bolt is quite obvious. One does turn the rear wheel with the bike on the stand during maintenance tasks. The chain moves along as the wheel turns. 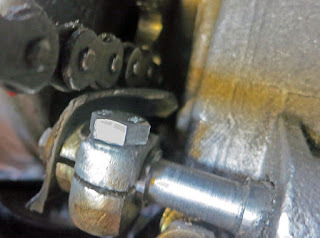 The contact isn't good for the bolt and can't be good for the chain. I determined to put some sort of shield over the bolt to nudge the chain up and away. The washer and bolt I'd fitted to the center of the shaft would hold this cover on. But what would make a good shield? I considered using the bottom of a tin can. Could this help? Bit of plastic chain guard found in a gutter! 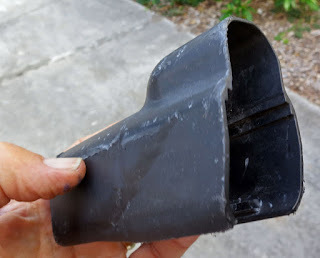 Then, on a stroll with my wife, I noticed a piece of black plastic in the gutter. It looked like part of a chain guard for a motorcycle or scooter. It wasn't much good for its original purpose anymore, as it had been run over and flattened by a car. But its shape and flexibility were perfect for me. I cut it down, drilled a hole for the bolt that would hold it on, and fit it on. With the motorcycle on its center stand the chain was now lifted clear of the pincher bolt. Scrap plastic chain guard cut down and fitted with a bolt. My homemade cover from the gutter may not last very long. But, at the price, it's probably still a bargain. With cover in place, pincher bolt is protected.